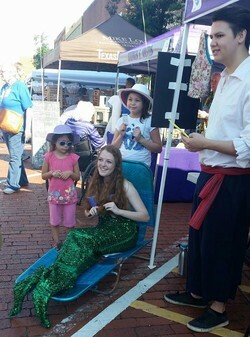 SFA theatre students Aubrey Moore and Connor Morrison, as characters from "The Little Mermaid," greet children at the 2017 Texas Blueberry Festival. NACOGDOCHES, Texas - Activities in and around The Cole Art Center @ The Old Opera House on June 9 will add to the traditional food, fun and festivities of the annual Texas Blueberry Festival. Students from the Stephen F. Austin State University School of Theatre dressed as popular characters from fairy tales and children's stories will again greet those attending this year's downtown event as they promote the upcoming SFA SummerStage Festival. The School of Theatre's trademark dragon character, Schlaftnicht, from the children's show "Trudi and the Minstrel," performed the summer of 2005, will make his annual Blueberry Festival appearance along with a dinosaur. Children (and adults) will have the opportunity to talk with the students and take photos with the costumed characters, according to Angela Bacarisse, professor of design and arts management at SFA. Additionally, Red Dirt Memories storytelling with Jerry Permenter will return with two sessions that day at 10:30 a.m. and 2 p.m. in Cole Art Center. Question-and-answer forums will follow each session. Another screening of the popular film "Found Footage: Rediscovering Nacogdoches" will be at noon in the art center. The screening will honor the late Brian Holt Davis who died last November and who played an important role in the film's making. Discovered at Nacogdoches High School in 1967 but forgotten until a few years ago, the film was digitally restored and viewed in 2014 for the first time in 70 years. This year's family-friendly SummerStage Festival features the children's favorite "Pinkalicious the Musical" with book by Elizabeth Kann and Victoria Kann, music by John Gregor, and lyrics by John Gregor, Elizabeth Kann and Victoria Kann, and the comedy-drama "Crimes of the Heart" by Beth Henley. SummerStage runs June 29 through July 19 on the SFA campus. Theatre students will also sell crafts and do face painting as a fundraiser for their biennial study abroad trip to the Edinburgh Festival Fringe in Scotland. The Cole Art Center traditionally serves as an official "oasis" during the festival, according to Lisa Steed, events coordinator for SFA galleries, with tables and chairs set up inside where festival patrons can escape the heat. The art center's restrooms will also be available to festival-goers. Volunteers with the Friends of the Visual Arts will man an outside tent where they will sell homemade gumbo, blueberry tea and blueberry baked goods with proceeds going toward funding grants and scholarships the FVA awards annually to students in the School of Art. The FVA will again sell notecards that feature photos of Nacogdoches landmarks as photographed by Christopher Talbot, Bill Nieberding, Ryan Russell, Stanley Bohon and other local photographers. June 10 is the final day to view the Texas National exhibition. Additionally, an exhibition of artwork by the late John Daniel, former SFA art professor, can also be viewed through June 16 in Cole Art Center. For performance times and ticketing information for the SummerStage Festival, visit theatre.sfasu.edu or call (936) 468-6407 or (888) 240-ARTS. Performances are in W.M. Turner Auditorium and the Downstage Theatre in the Griffith Fine Arts Building on the SFA campus. Both the Blueberry Festival and the SFA SummerStage Festival are sponsored in part by Tipton Ford Lincoln.